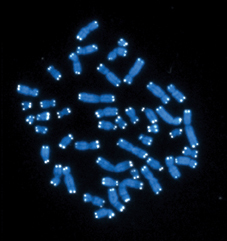 Shortened telomeres, the protective caps at the ends of chromosomes, are both a sign of aging and contribute to it. Image from NIGMS. Emory scientists have found that the dietary supplement alpha lipoic acid can stilmulate telomerase, the enzyme that lengthens telomerase, in mouse blood vessels. The results were published Thursday, August 20 in Cell Reports. Co-authors include assistant professor Lu Hilenski, PhD, Nikolay Patrushev, MD and Farshad Forouzandeh, MD, PhD. The research was supported by the National Heart, Lung and Blood Institute (HL60728) and as part of a Program of Excellence in Nanotechnology (HHSN268201000043C).